Small, insignificant events can dramatically affect the future. In the 1600’s, Louis XIV of France was at the height of his power, but unfortunately, that was the only height he could claim. You see, even though he was one of the most beloved monarchs in history, he was very short at 5’4”. Since the cards were stacked against him in the height department, he decided to use lifts to even things out–he added a few inches to the heels of his boots. The elevator shoes raised his stature, but he got knocked down a few pegs when he noticed he’d started a fad in his Royal Court–soon everyone was wearing lifted shoes. Not to be outdone, Louis added even more height to his heels–up to 6 inches more, and the Royal Court followed suit. Soon people were tottering around in footwear resembling the Frankenstein monster at a disco. In time, men’s heel size came back down to earth, but the women continued to stay perched on high. Then in the 1800s, American women began emulating the exotic styles of Paris, and soon “French heels” became part of the American fashion scene, and were referred to simply as “high heels.” One short monarch in the 1600’s has affected every woman in this room and the shoes she wears–it is all Louis’s fault. Ladies, that short French king affected you. There is another ancient event that also dramatically affected the immediate future, and will radically affect even our future—it’s found in Daniel 7. Turn there in your Bibles, and follow along in your outline to discover what we should expect in the future. Why is this important? The second coming of Christ is mentioned eight times more than His first coming. The Lord referred to His second coming 21 times in the New Testament. We are told over fifty times in the New Testament to be ready for Christ’s return. And Daniel 7 describes the second coming of Christ. So we need to know what Daniel 7 says—it was written a few years before the Medo-Persian Empire sends back all the Jews in captivity who desire to return to the land of Israel. This vision was meant to help them know what to expect. In 538 BC Cyrus makes a decree, and in 536 the Jews return to their land with Zerubbabel. Like a movie preview, God gives Daniel some scenes of the immediate future and of the eschatological future, so Israel can know what life is going to be like now and later when they return to the promised land, but now live under Gentile rule and so we can know what God’s plan is for our future. But it will not be easy. I hope you ate your Wheaties today, because even though this chapter is straightforward and not complex in another sense, this chapter is an interpretive nightmare that I have literally invested extra hours of study into, in order to make it clear. Normally, I study 24 hours per sermon–this was way over 30 hours. This morning as always, I will take a normal, literal, interpretive approach. There is a wrong assumption in certain theological circles, that while ordinary Scripture can be interpreted in a normal manner, prophetic portions of the Bible that use symbolism must be treated differently, interpreting them allegorically. Now it’s true that prophecy sometimes is presented in a symbolic way, but often the Bible itself provides the answers as to what these symbols literally mean. For example . . . In verse 24 of Daniel 7, the Bible is clear and direct that the ten horns of the fourth beast are actually ten literal kings. There is no need to guess or allegorize here or in other prophetic Scripture, since the Bible often gives you a direct literal meaning of the symbols in the immediate text or in parallel texts. So in your outline today, there is Scripture listed for your further study, and given as evidence to show how many arrived at the same conclusions I did. Symbols in the Bible are word pictures that present literal truths in a picturesque way. And what is most important today is that we let the Bible interpret itself—normally and literally. All that to say, there are other interpretative approaches that are embraced by some even in our church who we love a lot, but we agree to disagree concerning end time events. Regardless, all of us can rejoice that God is in control of history, and that Jesus is returning soon. Amen? Come Lord Jesus! But never forget, this chapter is God’s Word which is 100% accurate, 100% authoritative, and 100% going to happen. And Daniel 7 should give you hope. With the decline of our nation, the uncertainty of our economy, the fear of terrorist attack, the growing strength of European nations as a federation, and international instability, Daniel 7 is a good reminder for us to own Isaiah 40:15, “Behold, the nations are like a drop from a bucket, and are regarded as a speck of dust on the scales.” Daniel 7 gives us hope, because our King is coming, and His Kingdom will supersede every nation and all empires. Now Daniel not only interpreted dreams, but during the history described in chapters 1 to 6, Daniel also received a total of four visions. The very first vision is described here in Chapter 7, which is remarkably similar to Daniel 2. Remember the chiastic parallelism 4 and 5, 3 and 6, 2 and 7. Both chapter 2 and 7 predict the same future. There is parallelism between Nebuchadnezzar’s dream in chapter 2 and Daniel’s vision in chapter 7. Both chapters 2 and 7 give a panoramic sweep of Gentile world history, showing there will be four great empires, each succeeding the others, with history coming to a climax when God’s literal Kingdom is established on earth, and His Son, the God-man, the second Adam reigns. But why cover the same ground twice, in chapters 2 and 7? Answer–to emphasize some important differences between the chapters. Chapter 2 was a dream seen by a pagan king portraying history as men would view it, each empire having some intrinsic value, describing empires as colossal and glorious, like Nebuchadnezzar’s giant statue. But Daniel’s vision in chapter 7 was given to a man of God, so here God describes the nations of history as they really are–ferocious, bloody beasts, continually fighting and devouring each other. Man looks at nations and sees achievements, but God looks at nations and sees rebellion, destruction and murder. Also, chapter 7 will prepare God’s people for persecution, and warn them of deception by describing a coming wicked ruler bent on attacking and killing God’s people called the antichrist. So what should we expect in the future? So here in Daniel 7:1 to 3, out of this restless sea of sinful nations, God will cause four different beast-like kingdoms to appear one after another. And this chapter declares that the storm of humanity will not end until the Messiah returns and sets up His own Kingdom. This is to give God’s people, especially the Jews in captivity, hope that ultimate victory and deliverance will come. But from these stormy waters, possibly in that geographical location, come four great Mediterranean empires, four great beasts. Who are they? Verse 4, “The first was like a lion and had the wings of an eagle. I kept looking until its wings were plucked, and it was lifted up from the ground and made to stand on two feet like a man; a human mind also was given to it.” This verse describes Babylon, because chapters 2 and 7 are parallel, plus chapter 2 names the head of gold as Nebuchadnezzar. And three of God’s prophets speak of Babylon and Nebuchadnezzar as a lion or eagle. And finally, archeology has found many winged lions in the ruins of the city of Babylon–Daniel is talking about Babylon. The wings symbolize the swiftness of Babylon’s conquests and the lion demonstrates Babylon’s cruel strength. And don’t you love the description of the wings being plucked off, describing the humbling of Nebuchadnezzar and his conversion to faith in the one true God, to the God of Israel, which turned him from a beast into a man in Daniel 4, becoming more human in his rule. But this led to . . .
Verse 5, “And behold, another beast, a second one, resembling a bear. And it was raised up on one side, and three ribs were in its mouth between its teeth; and thus they said to it, ‘Arise, devour much meat!‘” This leaning bear beast, describes Medo-Persia, which Daniel predicted would conquer Babylon in Daniel chapters 2, 5 and 7. Being raised up on one side describes the Persians gaining ascendency over the Medes (which is also true today, with the Iranians–the Persians, having greater strength than the Kurds who are the Medes). The Persians were stronger than the Medes. Daniel 8:3, “Then I lifted my gaze and looked, and behold, a ram which had two horns was standing in front of the canal. Now the two horns were long, but one was longer than the other, with the longer one coming up last.” Verse 20, “The ram which you saw with the two horns represents the kings of Media and Persia.” The three ribs are most likely the three major empires that the Medes and Persians conquered, making a meal of them–Babylon, Lydia and Egypt. Plus the phrase “devouring much flesh” describes their appetite to continue conquering the world, which they did, only to be stopped by . . .
Verse 6, “After this I kept looking, and behold, another one, like a leopard, which had on its back four wings of a bird; the beast also had four heads, and dominion was given to it.” The leopard-like beast that defeats the Medo-Persians is the empire of Greece under Alexander the great and his successors. The leopard is cunning, cruel, and with four wings is extremely swift, which describes Alexander’s worldwide conquest. The four heads of the beast symbolize the four generals who divided up Alexander’s empire after his death. The phrase dominion given to it in verse 6 is significant–who could imagine the Greek army of only 35,000 men defeating every city and nation of the world, as well as the armies of Persia numbering in the millions. It was not only Alexander’s skill, but simply that God chose to give the Greeks dominion. Don’t you wish every ruler understood that truth? God was working out His will through Alexander. Because of him, our New Testament was written in Koine Greek, one of the most exact languages ever written. In fact our language, our culture and our democratic government all have their roots in the Greek empire. This is why Gus Portokalos says in My Big Fat Greek Wedding, “There are two kinds of people–Greeks, and everyone else who wish they was Greek.” But after Greece came . . .
Verse 7a, “After this I kept looking in the night visions, and behold, a fourth beast, dreadful and terrifying and extremely strong; and it had large iron teeth. It devoured and crushed, and trampled down the remainder with its feet.” The fourth beast is so fierce and terrible, no animal can describe it. This description is given to emphasize its destructive power. Because it follows Greece historically, and its description matches its temper perfectly, the fourth beast is Rome, who devoured, crushed, and trampled down the known world. Now even though I’ve separated the next empire, it really is not separate from Rome. The Roman empire never really ended, which leads us to . . . The beast representing a revived Rome had ten horns on its head, then another little horn appeared abruptly, gained strength, and maneuvered itself over three other horns. The eyes describe great intelligence–plus uttering boasts speaks of verbal skills and pride. This vision is so disturbing to Daniel, he will ask an angel for its meaning as the chapter continues, which helps us with interpretation. Some have tried to find fulfillment of this prophecy already in history, but those attempts are forced. It’s best to view this description as a future Roman Empire that will appear with ten rulers who will reign simultaneously. Then a unique ruler will rise up and maneuver over three rulers, eventually dominating the entire federation of rulers and becoming the world dictator. All this seems to fit during the seven-year time of coming judgment called the tribulation. This world ruler, this antichrist, will be an intelligent, arrogant and cunning political leader whose rule will come to an end at the return of Christ. In the book of Revelation, each time the book describes massive human death and evil, the Spirit moves John to return to a heavenly scene to give perspective, and affirm God’s control and purpose. We see the same with Daniel chapter 7. Now in verse 9, the vision jumps from earth to heaven to affirm God’s control. The scene shifts from the arrogant earthly blasphemies of the antichrist, to the heavenly service of angels since . . .
Verse 9 to 10, “I kept looking until thrones were set up, and the Ancient of Days took His seat; His vesture was like white snow, and the hair of His head like pure wool. His throne was ablaze with flames, its wheels were a burning fire. 10 A river of fire was flowing and coming out from before Him; thousands upon thousands were attending Him, and myriads upon myriads were standing before Him; the court sat, and the books were opened.” I believe verses 7 to 8 carried us into the tribulation and the evil work of the antichrist. 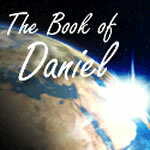 Now in verses 9 to 10, in order to gain a heavenly perspective, Daniel shows us our God is the judge of all. The title Ancient of Days is a name for God that emphasizes His eternality–God exists before nations, after nations, He is above all empires. His white clothing and hair speak of His holiness. God is not murderous like earthly kingdoms, but He is pure, just and holy. Fire and burning refer to judgment, and God’s throne and wheels speak of His glory and worth. Myriads of attending angels describe God’s irresistible will which can’t be stopped. And the court and books speak of perfect judgment–not capricious judgment and inaccurate records of humans and nations. God is just, and has perfect records of every life ever lived, and when judgment day comes, the books on every life will be opened. Read with me Revelation 20:12, “I saw the dead, the great and the small, standing before the throne, and books were opened; and another book was opened, which is the book of life; and the dead were judged from the things which were written in the books, according to their deeds.” What is written in the books of judgment about your life? And God will control the longevity of every kingdom, verse 12, “As for the rest of the beasts, their dominion was taken away, but an extension of life was granted to them for an appointed period of time.” God’s judgment includes all human leaders and all human kingdoms, and His sovereignty rules over their entire time of existence. (God was sovereign over the Reagan years, and He is sovereign over the Obama years.) All nations are under His sovereign plan. Nations begin when He chooses, and they end when God decides and not a moment before or after. But what do we have to look forward to? This scene turns to the one who will carry out the sentence of judgment–this is none other than the hero of all history, the King of all Kings, the only Savior who can rescue me from my sins, Jesus Christ–eternal Son of God, both God and man, called Himself the Son of Man, who describes His second coming here just like God does in the New Testament and Old Testament. But Daniel is still concerned about what He has seen–horrible evil is on the rise and God’s people are being killed, so . . .
And I am glad Daniel did–but also sad for Daniel because . . .
Verse 15 and 16, “As for me, Daniel, my spirit was distressed within me, and the visions in my mind kept alarming me. 16 I approached one of those who were standing by and began asking him the exact meaning of all this. So he told me and made known to me the interpretation of these things.” Daniel is strongly reacting to what he’s seen. So he asks for help to understand what his vision means from one of the angels who stands before God’s throne. Unlike the employees at Sears, this angel servant is actually helpful in two ways. Like a newspaper article, the angel gives a short summary of the entire future game plan in verses 17 to 18, then expands his answer in greater detail in verses 23 to 27. Verse 17 to 18, “‘These great beasts, which are four in number, are four kings who will arise from the earth. 18 But the saints of the Highest One will receive the kingdom and possess the kingdom forever, for all ages to come.’” The angel tells Daniel that the four beasts represent four kings which arise from the earth–they come from the world of men. Viewed together as a unit, this unique time ends when the last kingdom is destroyed, and God’s righteous kingdom takes over. This final kingdom is given to the saints of God, and the context suggests they will possess an earthly kingdom forever. But Daniel still has not had his greatest concern answered, so . . . Truth one–Daniel is troubled when God’s people are in danger. I love that this bothers Daniel. His heart-focus is on the saints. There are a lot of crazy things going on in this vision–the entire future of the world is being described, but Daniels heart is on God’s children, the ones that belong to God are being attacked, hurt and killed. The Bible tells us this evil world leader horn (antichrist) will kill 2/3 of the Jews, conquer the city of Jerusalem, slaughter a myriad of Gentiles, and wear out the saints of God–and Daniel is broken over this news. That is the heart of every true believer–great concern for God’s people. Not only a heart for your own family and relatives, but a great care for God’s family. As the Bible says in Galatians 6:10, “While we have opportunity, let us do good to all men, and especially to those who are of the household of the faith.” Is that your heart? Are you especially good to those in God’s family? Then how would you respond to a true vision of the future? Would you say, “God show me how you’re gonna wipe out the Democrats?” Would you ask, “How will you judge all those Hindus and Muslims?” Or would you only hope to see the Lord rescue your family? Or would your heart truly be burdened for God’s people, like Daniel was? Notice also . . . Truth two–Daniel understands more than he has let on here. Verse 20 In the future, just how ten major kingdoms or leaders will come from Rome. And how one will rise up and become more powerful than three kingdoms, then become the leader of all the kingdoms, becoming a man full of pride. Verse 21 This evil antichrist will attack the saints and kill many, until . . .
Verse 22 The return of Christ, the judgment of the lost, and the reign of Christ with the saints in a worldwide earthly kingdom. But Daniel still wants to know more detail–how did the angel answer him? What is going to happen is all part of God’s plan, even . . . There are prophecies in the Old Testament where the first coming of Christ and the second coming of Christ are in the same Old Testament verse, with no indicator of a time gap between them. Remember when Jesus is reading the Scripture in Nazareth in Luke 4, and he stops reading Isaiah 61 in the middle of a verse, and says (Luke 4:21), “Today this Scripture has been fulfilled in your hearing.” Had he continued reading from the verse in Isaiah, He would have been talking about His second coming. So His first and second coming can be found in the same verse without a time indicator. So it’s not a stretch to see the Roman Empire and the rebirthed Roman Empire in view here in Daniel 7:24 and 25 without a time indicator. What will it be like? Verse 24 clearly states the ten horns symbolize ten kings who will arise out of the region once controlled by Rome. The kings will all reign at the same time, which is a phenomenon not found in the past thus far. The expectation is for the Roman Empire (the fourth beast) in this form to reappear, and the ten leaders to rise to power in the last days. Revelation 17:12 describes a similar picture, “And the ten horns which you saw are ten kings, who have not yet received a kingdom, but they receive authority as kings with the beast for one hour. Most believe the other little horn arising to power in the midst of the ten horns is the antichrist. What will he be like? Verse 25, “And he will speak out against the Most High and wear down the saints of the Highest One, and he will intend to make alterations in times and in law.” Several facts arise from this verse and the entire chapter. 1 The antichrist will rise to power–he will be a highly intelligent political genius. In verse 8 it says a little one came up among them, and three of the first horns were pulled out by the roots before it. Then in verse 20, the other horn which came up, and before which three of them fell, pulled out by the roots, is not as violent as it sounds. The Hebrew indicates it’s more of a squeezing out of the other leaders, as if politically. There is a picture of this in Revelation 6:2, “And I looked, and behold, a white horse, and he who sat on it had a bow; and a crown was given to him; and he went out conquering, and to conquer.” The antichrist has a bow, but no arrows. Apparently he will do more by threat than by war. 2 The antichrist will persecute the saints. Verse 21, “that horn was waging war with the saints and overpowering them,” and verse 25, “and wear down the saints of the Highest One.” Many other verses warn us He will seek to harass, afflict, and persecute believers without mercy, and many will be martyred for their faith. Like Antiochus Epiphanies of Syria we learn about in chapter 11, and Adolf Hitler of Germany, this evil leader will attack God’s people. 4 The antichrist will attempt to change moral and natural laws. Verse 25 says he will intend to make alterations in times and in law. The leaders of the French revolution tried to replace the seven-day week established by God with a ten-day week, and the antichrist will try to alter worship days and times and festivals and feasts, as well as try to alter any laws that might honor God and His Word. 5 The antichrist’s reign will come to a sudden end, which leads us to . . .
Verse 25b, “and they will be given into his hand for a time, times, and half a time.” Fortunately the antichrist’s reign of terror will be limited–his authority will not last forever. Understanding a time signifies a year, times signifies two years, and a half of time is then a half a year–meaning, he’ll only have 3½ years to persecute God’s people. which harmonizes with the rest of Scripture on the timing. But is there a solution to earth’s problems? Can we expect to see permanent peace on earth someday? Yes–but it will not come through politics, nations, leaders, Rush Limbaugh, or the Republicans. God’s permanent solution will come when God once again directly intervenes in human history by sending His Son, Jesus Christ to judge, then reign on the earth. Verse 26, “But the court will sit for judgment, and his dominion will be taken away, annihilated and destroyed forever.” The day of man’s rule will be over, there will be no more kings, rulers, dictators, warlords, presidents–no more Democrats, Republicans, no more nations or empires. They’re all annihilated to make room for . . .
Verse 27, “Then the sovereignty, the dominion, and the greatness of all the kingdoms under the whole heaven will be given to the people of the saints of the Highest One; His kingdom will be an everlasting kingdom, and all the dominions will serve and obey Him.” God’s people are going to be given a kingdom, just as Revelation 20:4b promises, “and they came to life and reigned with Christ for a thousand years.” This Kingdom will last forever–a thousand years, followed by a new heaven and a new earth that will last forever. Everyone, including all rulers, will serve and obey Christ forever. Wow, what a vision–how do you react to what you’ve heard? Look at . . .
Verse 28, “At this point the revelation ended. As for me, Daniel, my thoughts were greatly alarming me and my face grew pale, but I kept the matter to myself.” The vision just devastated Daniel–his thinking was messed up, and he was physically in shock by what he saw. I have the same reaction, and so did the apostle John in Revelation 10. When Jesus receives the title deed to the earth in Revelation 10, John found that it was both bitter and sweet, and it should be for all of us too. Sweet, in that Christ reigns at last, and everything is made right. Bitter, in that when Jesus finally physically reigns on the earth, that means all those who have rejected Christ–everyone here, in the past, present and future–all will be eternally damned to hell forever. So what should we do? We celebrate democracy, science, medicine, space travel, food production, transportation and other achievements of civilization–and these are good things. But God clearly sees human history as a chronicle of immorality, brutality and depravity. Though we should rejoice in good things, we must never forget that nations and leaders may mask their true character from people for a time, but they are always unmasked before God. God knows what men and nations of men are–they are destructive, hateful, murderous beasts. There is only one way to demonstrate that you see your life here the way God does–one indicator. Do you know what it is? You see life here on earth Biblically, when every day you say as John did in Revelation 22:20, “Come, Lord Jesus.” Is that you? God is in control. Psalm 115:3, “Our God is in the heavens; He does whatever He pleases.” Therefore, in a persecuted environment, what does Peter tell the Church to do? First Peter 5:7, “Casting all your anxiety upon Him, because He cares for you.” It is sin to live in fear. What does it look like to live by faith in this world? Peter also explains this in 1 Peter 2:9, “You are a chosen race, a royal priesthood, a holy nation, a people for God’s own possession, that you may proclaim the excellencies of Him who has called you out of darkness into His marvelous light.” The main way to demonstrate your faith in a fallen world is to fulfill your purpose here, to show off and share Jesus Christ–to tell others how they can be right with God through Christ alone and His work on the cross. Are you living by faith? I used to teach classes about the end times, but got discouraged. The reason was, people were more interested in facts than living holy–they wanted to argue more than deal with sin in their lives. But God tells us twice that the study of end times is supposed to make you live pure and blameless and holy and Christlike. First John 3:2 to 3 says, “We are children of God, and it has not appeared as yet what we shall be. We know that, when He appears, we shall be like Him, because we shall see Him just as He is. 3 And everyone who has this hope fixed on Him purifies himself, just as He is pure. And 2 Peter 3:13 to 14, “But according to His promise we are looking for new heavens and a new earth, in which righteousness dwells. 14 Therefore, beloved, since you look for these things, be diligent to be found by Him in peace, spotless and blameless.” If the reality of Christ returning any moment, and you facing your creator for how you have lived and are living, doesn’t make you live more pure and more holy, then you don’t understand who Christ is. When the books are opened in Revelation 20:12, do you know what God will be looking for? He’ll be looking for a big “canceled” stamped on the center of your page. And that will only be there if you have given your life to Christ, and His death for sin on the cross is applied to your debt. If you exchange all that you are for all that He is, you turn to Christ in faith and repentance, you are internally born again, then your debt will be paid, and Christ’s work will cancel the debt you owe for sin. But if you trust in a decision you made once, a church you attend, a family member, a camp experience, an idea that everyone makes it to heaven, or that God won’t send me to hell, or that all religion is the same–then when the books are opened, your debt will not be paid, and as a result, you will pay your debt forever in hell. The only escape from hell is Christ. He took God’s judgment for sin upon Himself, but you must embrace Him and His work alone–do that today.